Composed by Maurice Ravel (1875-1937). String Ensemble - Mixed. Dover Edition. Impressionistic; Masterwork. Book. Dover Publications #06-438074. Published by Dover Publications (AP.6-438074). Ravel was known as a musical master craftsman, and some of his most exquisitely crafted music can be found in his chamber works, including the celebrated Piano Trio of 1914. 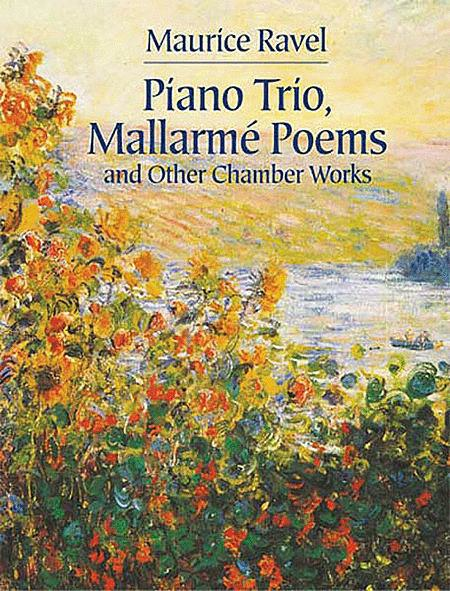 It appears here with the remarkable Mallarme Poems (1913), which show Ravel at his most harmonically adventurous and are scored for an ensemble inspired by the modernist works of Stravinsky and Schoenberg. Also included are the brilliant Sonata for Violin and Cello (1922), which the composer considered a pivotal work in his stylistic development, and the sensual Introduction and Allegro (1905) for harp and ensemble.